Indianola Iowa Balloon Rides in Des Moines and Indianola Iowa - Iowa's #1 Balloon Ride Company! We are now booking rides during the National Balloon Classic starting on July 25th through August 2nd! Call us at 515-265-2402 for special rates! Fly with your local balloon ride company! Would you like to fly during the National Balloon Balloon Classic and see other balloons while you fly? We are your answer! 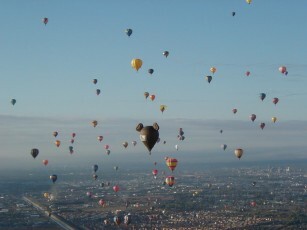 We will fly close enough to the balloons so that you can see all 50 balloons, but yet far enough away that we won't interfere with their competition events. Since 1990 we have offered Balloon Rides to view the National Balloon Classic from the best seats in the house...another Hot Air Balloon! We fly semi-private flights and everyone has a front row seat. We don't fly a busload of people. This is a unique experiance. We will fly from just west of the NBC field in Indianola and we will be only one mile away from the action! If you are looking for a fun time and a special balloon flight, then this is the ticket! We suggest booking early as these dates fill up rather quickly and it is first come, first served.